Todd S. Unger, Esq. LLC assists people nationally and internationally with IRS tax problems; yet our law firm also provides in-person service to local New Jersey residents. With two offices, residents and businesses in both the north and south parts of New Jersey can get the guidance and legal advice they need when dealing with the IRS. New Jersey residents and businesses that are facing the IRS can contact tax attorney Todd Unger to help with the process. The IRS does not stay in line with a taxpayer’s best interests; instead, it does everything it can for the government to benefit. This agency strives to obtain the highest amounts of taxes, penalties and interest as it can from taxpayers. Therefore, taxpayers should not rely on the IRS to guide them with their tax problems. There might be options available to ease a financial burden that the IRS and tax resolution companies do not make the taxpayer aware of. It is a better idea to talk to a professional tax attorney who knows the ins and outs of tax law and can give legal advice to taxpayers. In New Jersey, Todd S. Unger, Esq. LLC, is specialized in this type of law to help taxpayers handle the IRS. Instead of working with IRS agents who are trying to benefit the government or sales associates without legal training, individuals and businesses will work directly with experienced tax attorney Todd Unger. 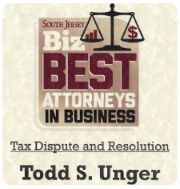 Todd Unger helps individuals and businesses throughout New Jersey with tax problems. Our office can assist with many services, from helping with an audit to guiding you in options for managing tax debt. Our law offices include two convenient locations in northeast New Jersey and southwest New Jersey. This allows us to provide services to residents in many parts of the state. The office in Mt. Laurel serves residents of various nearby areas, including Cherry Hill, Camden, Moorestown and Haddonfield. All residents of South Jersey, from Vineland to Toms River, can conveniently reach this office. North Jersey residents can easily visit the Woodbridge office. It is especially accessible if you live in neighboring areas of Edison, New Brunswick, Newark, Morristown and Elizabeth, although residents living anywhere in North Central New Jersey and beyond can rely on this tax office. For more information, please visit our tax services page. If you’d like to get in touch with a professional tax attorney, fill out our website contact form or call our office at (877) 544-4743.